PESTT is an Eclipse plug-in for learning and designing unit tests for the Java language. Currently, PESTT supports unit tests based on the control flow graph (CFG) of methods. It generates the CFG based on the source code of the method, allows for bidirectional linking between the source code and the generated CFG, generates test requirements, allows for the specification of test paths, computes the coverage level statistics, and much more. The following screenshot gives a flavor of PESTT in action. 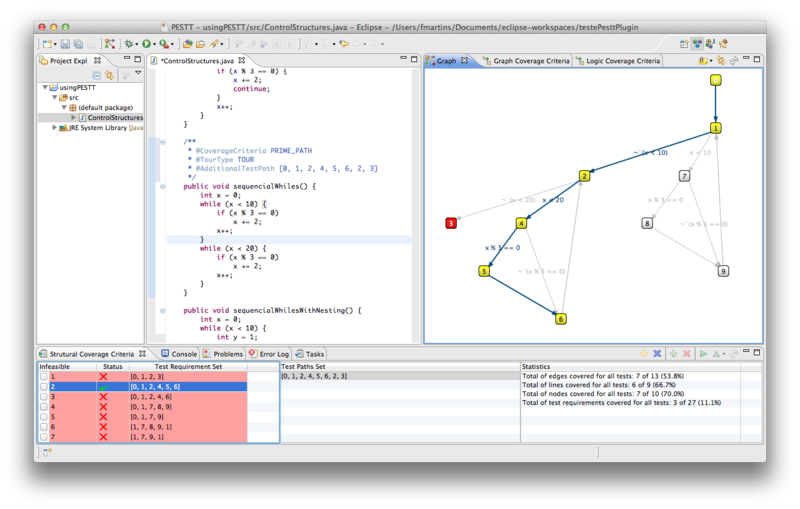 The PESTT perspective shows the CFG of method sequencialWhiles on the right view (Graph), and on the bottom, the Structural Coverage Criteria view shows the test requirement set (left), the test path set (in the middle), and the coverage level (right). to the install window (for instance, drop it at the big white area in the middle of the window). If the drag and drop is not working (for instance, Ubunto 11.10) copy the update site link http://pestt.github.com/updateSite to the work with field and press enter. Press the next button and follow the installation instructions. We do not setup information about licenses, etc. Also, trust us and accept the unsigned plugin. It will all come together at version 1.0 (to be released in July, 2012). Restart Eclipse. The installation is now complete. You need to go to the Eclipse preferences window and setup the location for the dot program that is part of the Graphviz software. We found this easier than asking you to change the operating system global path, which differs from operating system to operating system, even from version to version of the same OS. Select the PESTT preference page and specify the path for the dot program. In the MAC OS it is located as the below figure shows. Press the OK button and that’s it. We are ready to start! If you are new to PESTT, maybe it is time to take a quick tour.